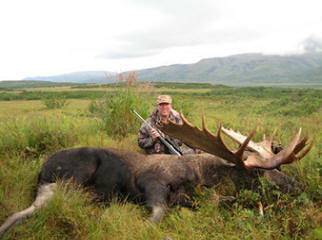 Our Alaska moose hunt takes place on the Alaska Peninsula in September, between the 8th and the 25th yearly. 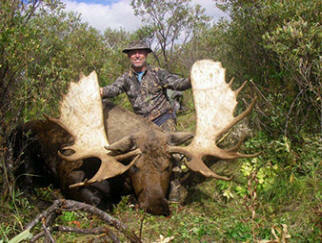 We hunt Unit 9E which has a minimum antler size restriction of 50 inches or better. 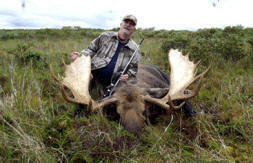 Our target is moose with antlers over 60 inches. When the season opens, the rut is just beginning. We track moose throughout the Fall. We choose our moose for their size and points and put a camp in as near as possible. You will fly to my Pumice Creek Camp on Pen Airways and spend a night at the main camp. The next day you will be flown out to a spike camp with your guide. Your hunt generally takes place within 10 miles of base camp. Your days on this hunt will be spent glassing a short distance from your camp. When at the spike camp, you will be checked on every couple of days by aircraft or by radio or sat phone. If you are unsuccessful in an area after three to four days you will be moved, weather permitting. Most of my camps are portable and can be taken down and moved within an hour. We use Bomb Shelter tents and Go-Cots which are very accommodating and comfortable. After your hunt is over you can fish for silver salmon or Arctic char, which run up to eight pounds and try your luck at knocking down a few ptarmigan. You also have the option of taking wolves on this hunt, included in the price. 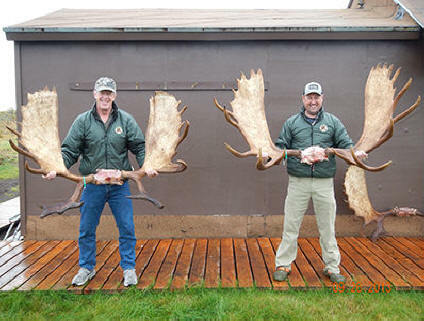 At your request, we can arrange to send your trophy antlers to Knight's Taxidermy in Anchorage. They prepare and ship for destinations worldwide. 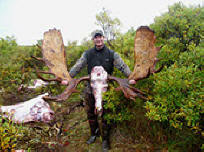 We take great pride in our years of experience guiding moose hunters to successful hunts, which in turn lead to many years of fond stories and memories of their Alaskan moose hunt with LaRose Guide Service. If you are in need of further help in planning your hunt, feel free to contact me directly any time. This hunt has been suspended due to wolf predation. Joe Gallardo of Miami, Florida smiles after taking a very nice 64 inch bull on his sixth day of his hunt. Opening day of the moose season was clear, still and 65 degrees and continued that way for four more days. The big bulls were nowhere to be found, laying down all day and not moving in the heat. Calling wasn’t working and is was too quiet to put a sneak on. Joe passed up a bull that he said looked like he grew up in a hall way. Everything went forward and not enough width for him. They finely got lucky and ran into this guy. The next day we went out to pack him in and a young brown bear was helping himself to the gut pile. We ran him off and nervously collected the meat and antlers and got out of there. Congratulations to Joe for holding out for the big one. 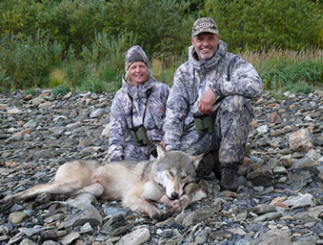 Dani and Marti Burkli from Switzerland shot this nice white wolf while bow hunting for moose. While they glassed for their moose, the wolf walked down the river looking for lunch. Dani put down his bow and picked up his guides rifle and put a hole in him. 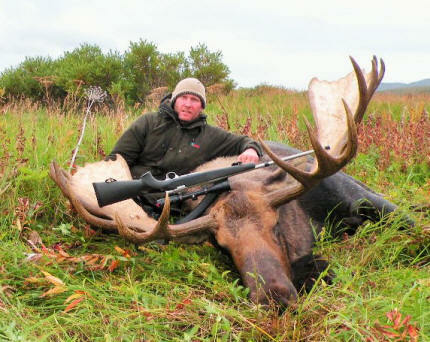 One less “moose-eater”. Ed Cooke from Burgettstown PA. with a nice 66 inch bull taken on the Pacific side on my US Fish and Wildlife permitted lands. The bull had about seven cows with him and guide Tim Hewett gave him a few bull calls and out he came to meet Ed’s well placed shot. The bull required about a two mile pack over fairly good bear trails to get the meat, cape and antler to where it could be flown out.